(Photo:© Peter Kenny)Graffiti on the Israeli separation wall between Jerusalem and Bethlehem in February 2016. President Donald Trump is a hog. He has knack for stealing the headlines whether they are fake or about fake governance and about world politics. And he has even done it with Christmas in Bethlehem, which is now immersed in Trump invoked discourse due to its proximity to Jerusalem. Christians throughout the world celebrate the birth of Jesus in a manager in Bethlehem, a city under the administration of the Palestinian authority that is only about 10 kilometers from Jerusalem. Trump managed to upset some global equilibrium when this month he said the United States recognized Jerusalem as the capital of Israel and wants to move it embassy there. Christmas Eve festivities in Bethlehem are being held against the backdrop of protests of Trump's declaration of Jerusalem as the capital of Israel, the Associated Press reported. Vatican officials crossed an Israeli military checkpoint from Jerusalem ahead of midnight Mass at the Church of the Nativity, which is believed to be the site where Jesus was born. As usual hundreds of locals and foreign visitors gathered in Manger Square as bagpipe-playing Palestinian Scouts paraded past the Christmas tree. Accompanying the decorations this year is a banner protesting Trump's Jerusalem declaration, AP noted. Since Trump's Jerusalem recognition, Palestinians have been clashing intermittently with Israeli forces outside the gates of the Jacir Palace Hotel, a luxury Bethlehem inn, The New York Times reported. As the clashes simmered on, sporadic and limited in scope, Bethlehem, like the rest of the Palestinian territories, seemed suspended in a kind of limbo. Residents were neither basking in seasonal cheer nor raging in the throes of a new intifada, the popular mood in the city was more one of hopeless resignation, said the Times. The Jacir Palace sits along a stretch of road that has become a main flash point for protests, only yards away from Israel's 26-foot-tall (8 meter) concrete barrier separating Bethlehem from Jerusalem, the contested holy city. Al Jazeera, the Qatar-based television and online outlet also harks on Mr. Trump's recognition of Jerusalem as Israel's capital looming "large in Christmas festivities this year in the traditional birthplace of Jesus." There some food vendors, sellers of holiday trinkets and a leading hotelier say Palestinian protests, triggered by what many here view as a provocative show of pro-Israel bias, have hurt their Christmas business. 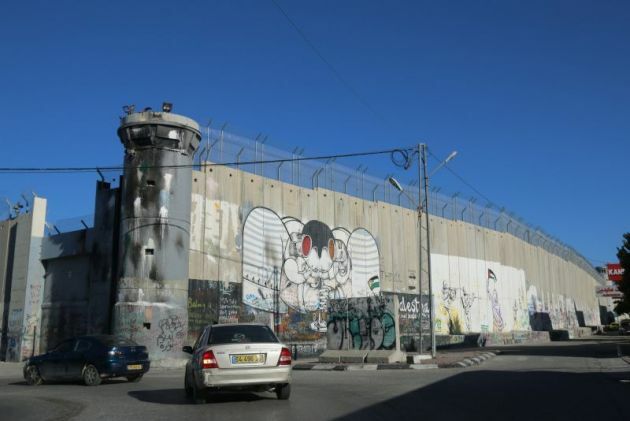 "Yet Bethlehem also offers a stage for a Palestinian rebuttal: banners proclaiming Jerusalem as the eternal capital of Palestine have been draped over facades on Manger Square as a backdrop for Christmas TV broadcasts to a global audience. "The Israeli-Palestinian conflict is keenly felt - perhaps even more so at Christmas - in Bethlehem, just a few miles (kilometres) south of contested Jerusalem," says Al Jazeera. It notes that Israel's separation wall cuts into Bethlehem and a segment of it has become a tourist magnet in its own right. The wall's cement slabs are covered with works by international graffiti artists such as Banksy and pro-Palestinian slogans left by visitors. Al Jazzera said that while Palestinians try to draw attention to the barrier when foreigners pour in for Christmas, Trump's policy shift on Jerusalem "has emerged as the dominant theme this year. It went again international consensus." It says that Israeli-occupied East Jerusalem houses major Muslim, Jewish and Christian shrines, and Palestinians seek it as a future capital. In Bethlehem's Manger Square the huge nativity scene, donated by Malta, sits in pride of place under a grid of festive lights draped across the plaza, Britain's Guardian newspaper, also wrote glumly. "Today – as every Christmas Eve – this square and the bulk of the ancient Church of the Nativity which sits on its periphery, will be lit up by television lights to allow images of Christmas in Bethlehem to be transmitted around the globe. "But once again, say the West Bank city's Palestinian residents – including the large Christian minority – it will be another gloomy holiday," the newspaper opined. It explained that for Christians "Bethlehem and Jerusalem are the alpha and omega of the Christian narrative; the first the birthplace of Christ and the second the site of his crucifixion and resurrection." In Palestinian Christian society during the major festivals, the faithful have traditionally shuttled between the two. But at the Vatican on Christmas Eve Pope Francis was looking to the greater flock. Speaking in St. Peter's Square after the Angelus prayer, Francis said he is praying for the dead and missing from a tropical storm which lashed southern Mindanao Island in the Philippines, Vatican News reported. His prayers are for the storm-stuck population of Mindanao Island in the Philippines where at least 200 people have been killed by floods and landslides and scores are missing. Speaking after the Angelus in St. Peter's Square on Sunday, the Pope said: "I wish to assure my prayers to the population of Mindanao Island in the Philippines, which has been struck by a storm that has caused numerous victims and much destruction". "May the merciful Lord receive the souls of the dead, he continued, and comfort those who are suffering for this disaster".